Squadron Hill is a 1960 subdivision located about a half mile west of Huntington village. Most of its inhabitants have been led to believe that the property was used by Theodore Roosevelt to train his Rough Riders prior to fighting in Cuba during the Spanish American war in 1898. One of the streets in the development is even named Rough Rider Court. There was once a sign on Main Street welcoming visitors to Huntington, “Home of the Rough Riders.” In fact, some residents talked about Rough Riders coming back after the houses had been built to view their old training grounds. But if anyone had stopped to do the math, they would have realized that a veteran of the Spanish American War would have been quite old by the time the houses were built. In 1898, Theodore Roosevelt was living in Washington, D.C. After receiving permission to form an all-volunteer cavalry force to fight in the Spanish American War, he went to San Antonio, Texas where the First Volunteer Cavalry trained and was given the nickname the Rough Riders. The closest Roosevelt’s Rough Riders actually came to Squadron Hill was Camp Wikoff in Montauk, where the unit camped after their tour of duty in Cuba. Prior to the publicity surrounding Roosevelt’s unit, the term “rough rider” appears to have been a generic reference to cavalry men. In later years, Theodore Roosevelt did visit Squadron Hill, but in 1898 the land that now comprises Squadron Hill was being farmed by Alfred Rogers, a member of a large and prominent family in the Cold Spring Harbor area (in fact, Turkey Lane was once known as Rogers Avenue). One hundred years ago Squadron Hill comprised the bulk of the Rogers’ 100 acre homestead, which was made up of two parcels—twenty acres north of Lawrence Hill Road and 82.5 acres south of Lawrence Hill Road, bounded on the west by Peabody Road, on the south by Saw Mill Road and Woodbury Road, and on the east by the land of various neighbors. The Rogers’ house, a five bay 2.5-story gable roofed house, still stands at 97 Lawrence Hill Road. The north wing of the house is estimated to have been built in about 1820 and the main house in about 1860. The house has recently been renovated and enlarged by its present owner. Alfred Rogers had inherited the farm from his father, Moses Rogers. Moses Rogers’ father, Zebulon Rogers, was a Revolutionary War veteran. Although the early records are unclear, it appears that Zebulon Rogers owned the homestead when he died intestate in 1820. An inventory of Zebulon Rogers’ personal property includes among other things, a house (valued at $60), four cows and six sheep. Moses Rogers appears to have acquired the homestead from his siblings following their father’s death. Known around town as “Uncle Moses,” he was born on April 25, 1784 in the old homestead. Moses Rogers, a wealthy but unpretentious man, was a farmer his whole life, working the farm up to within a few months of his death in 1878, just eleven days shy of his 94th birthday. The Rogers farm was diversified. According to the 1860 agricultural census, Rogers grew a variety of crops: wheat, rye, oats, Indian corn, Irish potatoes, barley buckwheat and hay. They also had 5 milch cows (producing 500 pounds of butter), 12 pigs and 50 sheep (producing 150 pounds of wool). In addition to farming, Moses Rogers owned several ships, including at the time of his death “an interest in almost every coal schooner that went out of Cold Spring and many of the Northport vessels.” He also served as the town’s Overseer of the Poor for several years. On Moses’ death, the homestead passed to his son Alfred, who was born in 1820. At his death 81 years later, Alfred was eulogized as one of Huntington’s “oldest and most respected residents.” Two months before his death, Alfred conveyed the farm to his son Franklin P. Rogers for one dollar, reserving a life estate for Alfred and his wife, Phebe Ann. Frank Rogers was the last of his family to farm the homestead. In 1905 Frank, his wife Esther, and Frank’s mother Phebe Ann sold the 82.5-acre parcel south of Lawrence Hill Road to a Brooklyn-based National Guard cavalry unit for $15,000 (including two mortgage notes, each in the amount of $5,500; one payable to Frank, the other to Esther). Frank apparently continued to farm the twenty acres of the homestead north of Lawrence Hill Road until about 1914 when he sold the remaining parcel to Jerome A. Suydam and moved to a house on Woolsey Avenue in Huntington. Frank and Esther had no children. In the spring of 1895, authorization was given by the Adjutant-General of the New York National Guard to organize a troop. On August 27, 1895, the North Portland Avenue Armory in Brooklyn was converted from infantry use to cavalry use. On December 16, 1895, Troop C was mustered into the service of the National Guard (the letter B was claimed by a troop forming in upstate Geneseo at about the same time). The troop was composed of well-to-do gentlemen of Brooklyn—businessmen, lawyers, doctors and college students. By 1898 the troop achieved full membership and when war was declared against Spain, the troop volunteered as a body to join the fight. In May 1898, the troop trained for three weeks at Camp Black on the Hempstead plains, after which the troop was mustered into federal service as Troop C of the N.Y. Volunteer Cavalry and eventually saw combat duty in Puerto Rico. By 1909, Troop C had a membership of 150 and a waiting list twice as long. The troop was expanded into a squadron with the same letter designation under the command of Major Charles I. DeBevoise. Following reorganizations and re-namings understandable only to the military mind, the Fourth Platoon of Troop C became Troop 6 of Squadron C and eventually Troop K of the First New York Cavalry. Membership in this National Guard unit was not strictly a military matter; There were social and recreational aspects as well. In 1905, a few of the wealthier members of the unit formed Troop C Armory Auxiliary, Inc. and purchased the 82.5 acres of the Rogers homestead south of Lawrence Hill Road. The farm was to be used as a riding club for members of the troop. The troop members also opened a clubhouse across the street from the armory in Brooklyn. 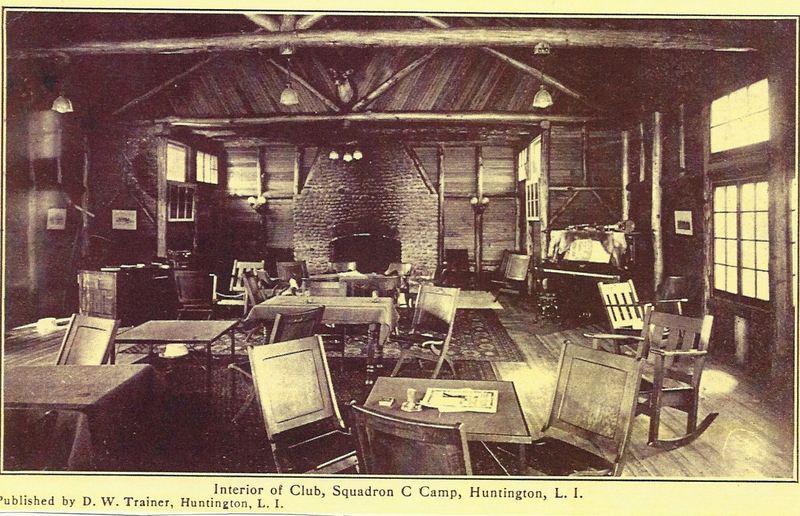 The clubhouse was operated by Squadron C Cavalry Club of Brooklyn, Inc., which was formed in 1915 and was open to members of Troop C of the N.Y. Volunteers, Troop C and Squadron C of the N.Y. National Guard, and the First Cavalry of the N.Y. National Guard who were quartered in Brooklyn. The unit had always raised its own horses because, while the State of New York supplied saddles, bridles and other equipment, it did not provided horses. The unit would buy and breed horses and sell those they didn’t want on the open market. They started with only a handful of horses and by 1912 had 300 of the finest quality military horses in the country. Representatives from the War Department came out to the Farm to inspect the horses and were impressed with their quality. The Brooklyn men were mobilized in July 1916 for federal service on the Mexican border chasing Mexican revolutionary Poncho Villa after his attack on Columbus, New Mexico. In March 1917, the unit was mustered out of federal service but remained as a National Guard unit. Just four months later, the New York National Guard was called into service to fight in World War I. By military alchemy, Troop K was transformed into Company A of the 106th Machine Gun Battalion and the cavalrymen were accordingly relieved of their horses. While the Brooklyn men were preparing to fight in France, where they would be credited with helping to break the Hindenburg Line, the men of the Huntington Rifle Club met to consider forming a Home Defense Reserve, which would train at Squadron C Farm. At the initial meeting on July 13, 1917 at the Masonic Hall, 24 men enlisted in a Home Defense League. Sixty more joined at a meeting the next night. Two volunteers had to be rejected from membership—Eugene Johnson, a veteran of the Civil War, was ten years over the age limit; and Thomas Miranda, an Italian immigrant, was not yet fully naturalized. The League started drilling eleven days after its inception and made its first public appearance in the Town’s Labor Day parade that year. A similar unit in Cold Spring Harbor mustered in as a Home Defense Corps under regulations promulgated by the Adjutant General of the National Guard. The Huntington group intended to do the same, but Major C.S. DeBevoise of Squadron C recommended that they join the National Guard whose ranks had been depleted when its members were federalized. The National Guard was now unable to perform its traditional duties, such as riot control or suppression of an uprising by the alien population (considered a real threat at the time). Moreover, a trained force was needed as a back-up to federal forces engaged in Europe. On September 26, 1917, 52 members of the Huntington group agreed to take the State’s oath of enlistment and became members of Troop K of Squadron C. Troop K trained through the winter in Huntington village and along its highways. The following June, horses arrived from the Armory in Brooklyn and cavalry training commenced at the squadron’s farm. Huntington residents drove out to Squadron C Farm to observe the military preparations. Squadron C donated a trophy awarded to the winner of the annual bobsled race held on Main Street (from the top of Cold Spring Hill to as far as New York Avenue) between 1907 and 1920. In 1909, the Troop escorted the first car on the inaugural run of the Huntington-Amityville trolley line and participated in Fourth of July parades. The troop also entertained local residents with monthly exhibitions and polo matches. According to legend, the cavalry was once called to quell a riot caused by an armed robbery. However, they also annoyed local merchants by galloping down Main Street. It was during the early years of the Farm that Theodore Roosevelt was a visitor. In August 1908 when he was President, Roosevelt rode an automobile over from his home in Oyster Bay to inspect the troops. Later visits were unofficial. According to William Stefurak, who joined the Squadron in 1936, older members mentioned Roosevelt’s visits. The President would “sit on the porch with the guys and swap lies.” The memories, records and photographs of some of the members, such as Bill Stefurak, provide a fuller description of the Farm and its activities from the late 1930s onward. The entrance to the Farm was on Lawrence Hill Road, more or less where Donovan Drive now begins. A sign near the main gate read, “Ladies will please not pass this point.” Ladies were thus deprived of visiting the race track to the right of the entrance road. To the left was a practice polo field, followed by two clay tennis courts behind which stood two cement handball courts (which stood until recently in the yard of one of the houses on Donovan Drive). South of the tennis courts were twenty bungalows, each equipped with six spring beds and with shutters on all sides that could be opened in the warmer weather. To the east of the bungalows stood the mess hall (which could accommodate 125 to 150 at a sitting) and the clubhouse. The stone fireplace for the clubhouse still stands in the yard of a house on Squadron Court. 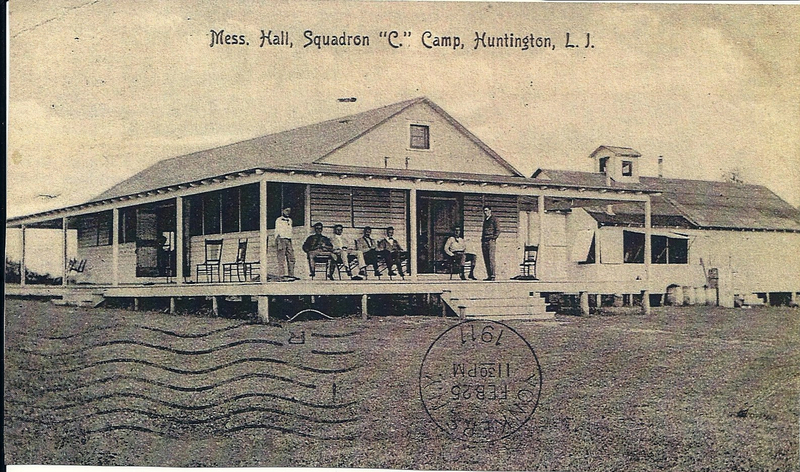 The mess hall, which was at a right angle to the club house, stood more or less where Squadron Court is now. Further south was the wash house or locker room and a water tower. The road ended in a T intersection. To the left (east) it led behind the wash house to a parking area. To the right the road led to the stable complex which stood approximately where Donovan Drive and Rough Riders Court now intersect and consisted of a shed, four stables, a barn, a water tower and pump house. To the south and west of the stables was the polo field. The Farm was open from early July to early September. From September to June the men trained once a week in the armory in Brooklyn. During the summer months, the horses were stabled at the Farm. Although the Farm was established for the benefit of the men, the horses seemed to be rejuvenated after two months in the fields eating fresh grass. Some members lived at the Farm all summer commuting to their jobs in the city. Most, however, came out just for the weekend. Although there was no charge to stay in the bungalows, the men were charged for breakfast (50¢) and dinner ($1) whether they ate on the Farm or not. Lunch was 75¢. Active members of the squadron, who paid $4.25 a month in dues, were charged 50¢ to ride a horse at the farm. Veteran members, who paid annual dues of $9, paid $1 to ride a horse. The dues paid for the upkeep of both the Brooklyn clubhouse and the Farm. There was also a sabre course in the southwest corner of the Farm where Peabody and Saw Mill Roads intersect. Some members would organize races on the racetrack near the entrance to the Farm. The track, which was in a hilly area, “was all up and down, the damnest thing you’d ever want to ride on,” remembers Stefurak. The men would wear racing silks and odds would be placed, but it was all done for fun. “You make a couple of bucks here, lose a couple of bucks. And if you made it, you’d buy beer anyway,” explains William Hurley, who joined the squadron in 1938. Polo matches between the squadron’s team and teams from the U S. Army and local polo clubs were held every Sunday. Spectators would enter through the white gate, which still stands, on Woodbury Road just east of Saw Mill Road. The members, most of whom were single, rode hard during the day and raised hell at night. “We lived like millionaires. We were the working class of Brooklyn and we lived very well,” adds Stefurak. But on the eve of World War II, the Farm was once again used for military training. Members enlisted in the federal service for one year from January 1941 to January 1942. That one year enlistment was soon extended for the duration of the war. The Farm fell into disuse and was leased to a local farmer to graze his cows. Reportedly the turf at the Farm was so good that during the war some of the sod was transplanted to Ebbets Field in Brooklyn, which was three blocks from the Squadron’s armory. To help commercial farmers work their fields in the face of labor shortages during the war federal and state agricultural agencies proposed using the Farm to house 250 Bahamans, who would work on local farms. The Huntington Town Board denied the request because it would violate local zoning laws. World War II also saw the demise of the cavalry. Horse fighting was deemed incompatible with modern warfare and both the U.S. Army and the New York National Guard abolished their cavalry units. During the war, there were no active members paying their $50 a year in dues, so “the Board of Governors had to make a choice between the Farm and the clubhouse. Most felt under the circumstances it was better to hold on to the Farm and to sell the clubhouse, which they did,” explains Hurley. this time to allow the club to hold real property and thus legitimize the purchase of the Farm. To be sure of good title, the club also received a quitclaim deed from Squadron C Farm, Inc., which had been managing the property for over twenty years. Still missing were horses. Since the cavalry unit was disbanded, there were no horses to bring out from Brooklyn. Squadron A, in Manhattan, did manage to hold onto its horses. Squadron A loaned the horses for the summer in 1947, but someone let them loose and the privilege was not extended the following year. Instead, the club entered into a month-to-month lease with John and Francis Rice to operate a horse farm on the site. In addition to receiving rent from the Rice brothers to pay the property taxes, club members could ride the horses for $2. Weekends at the Farm were now more do-it-yourself. There was no staff to cook meals and no set schedule of fees. Instead those who came out put up five dollars and shopping details were organized. The shoppers would drive into Huntington village, buy some steaks at Berger’s Butcher Shop on New Street and then stop at Finnegan’s for a drink before driving back up to the Farm. The steaks, or sometimes lobsters, were barbequed on Saturday night. “At night we got dolled up and we went out,” remembers Stefurak. In addition to tennis, the men, and now their wives as well, would continue to ride horses out into the countryside. The Melville beer garden was still a popular destination. 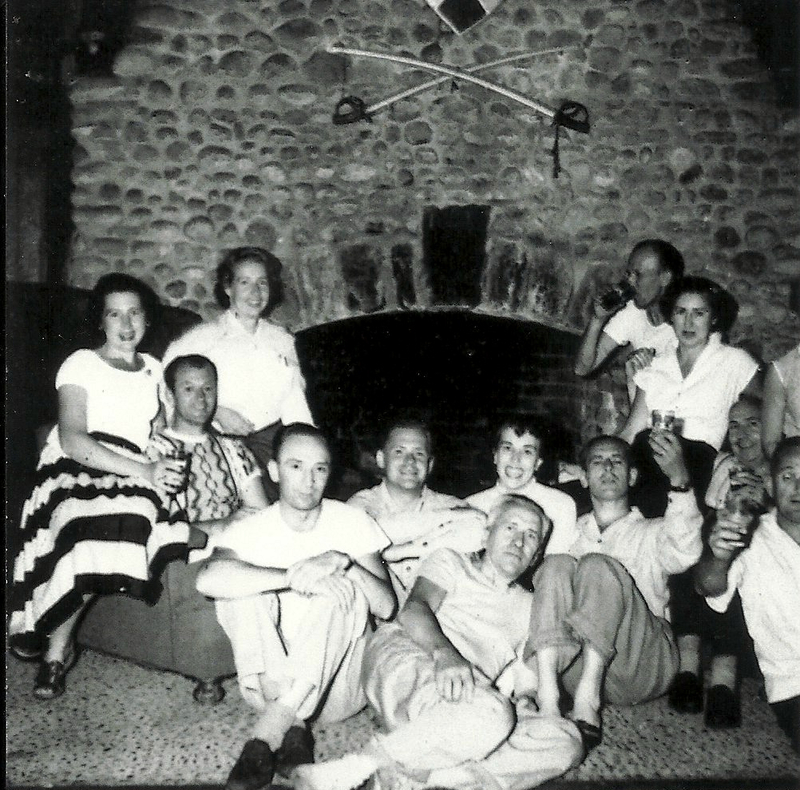 They would also visit the Marshall Field estate to swim in the Long Island Sound (the club members were admitted to the still private estate by the stable hands who knew them from the pre-war period). Sunday dinner was at Ma Glynn’s on East Main Street or Rothman’s in East Norwich. Bill and Ruth Stefurak were post-war regulars at the Farm. “It was a great weekend. I’d come out here. I’d ride, play tennis, swim, have a good drink, good eatin’. What more could you ask for? We had everything for nothing.” Immediately after the war, 50 to 60 members would regularly gather at the Farm for picnics. But as time went on and families grew, the number dwindled to about twenty, then to only 10 or 12. The Rice brothers converted the polo field into a show ring and gave riding lessons and organized horse shows there. In 1949, the Irish American Club held its first Irish Field Day at the Farm. Four years later, tens of thousands of visitors took part in the Town’s three day Tercentenary celebration at the Farm. Starting in 1950, members of the New York Greyhound Owners and Breeders Association transformed the old saber course into a dog racetrack complete with starting gates and an electric rabbit. Non-betting races were held every Sunday until 1966. Almost as soon as the Farm was up and running again after the war, efforts to sell the land began. Despite the desire of World War I era veterans to sell the Farm, the younger members kept the Farm going for 15 years. Eventually, club membership, which due to charter restrictions could not be replenished, was dwindling due to deaths. Furthermore, the club stopped accepting new members from among those who were eligible to join. Some members quit the club because of this change in policy. The older members argued that the purpose of the club—to encourage enlistment in the cavalry—was impossible because the cavalry no longer existed. Moreover, they argued, why keep the place going for the select few “who raised hell” on the weekends. The younger members, not all of whom used the Farm regularly, disagreed. They claim that the old-timers got greedy. Members opposed to the development of the Farm suggested donating the land to the Huntington School District, which was looking for a site for a new high school, or to the boy scouts. In fact, the Huntington school district in 1955 had a referendum to approve the purchase of 54 acres of the Farm to build a new high school to replace the crowded Main Street school (now Huntington Town Hall). The voters rejected the proposal by a vote of 1162 to 848. The new high school was built just a few years later on Oakwood Road. New York State approached the club about acquiring some of the land for an armory, but was refused. Another suggestion to re-route the proposed Bethpage State Parkway extension to Caumsett State Park from the shores of Cold Spring Harbor through the farm and Huntington Country Club was also not pursued. Bill Hurley, who did not visit the Farm much after the war, felt “there was an awful lot of skullduggery going.” He believed that many of those pushing the sale were also part of the group that sought to purchase the property. “They didn’t own the property. They didn’t put a penny down for the purchase price,” Hurley complained. Moreover, the club could afford to keep the Farm. In 1960, the annual real estate tax, insurance and maintenance costs for the property amounted to about $4,000. Dues from 144 members (there were also 22 life members who did not pay dues) netted the club $1,300 and the Rice brothers lease brought in $3,480 a year. However, if the Rice brothers, who had a month-to-month tenancy, decided to vacate, the club would have an annual deficit of about $2,700, an amount that could quickly deplete the club’s liquid assets of $10,500. The club’s Board of Governors, which considered the land underutilized and thought the club could benefit more from the money than from continued use of the land, approved the sale to Rough Riders Farm, Inc., the president of which was George R. Tollefsen, a member of the cavalry club. The purchase price was $290,000. Although not required, the sale was also voted upon by the membership at large which also approved of the sale by a vote of 79 to 33. Considerably more than the handful of members who used the farm regularly voted against the sale. The opponents of the sale were extremely bitter. “It kind of broke our hearts,” Stefurak recalls. In 1962, a proposal to develop the property with luxury apartments went nowhere. The clubhouse burned to the ground in a spectacular fire in October 1962 with flames reaching 50 feet in the air. Rough Riders Farm, Inc filed a subdivision map with the county on June 4, 1964. The map depicted three new streets. The names of two of the streets recall the land’s cavalry past—Rough Riders Court and Squadron Court. The principal street, Donovan Drive, was named after Rough Riders Farm, Inc.’s lawyer and principal, James B. Donovan. Donovan, a partner in the firm of Watters and Donovan, served as general counsel to the Office of Strategic Services during World War II and as an associate prosecutor at the principal Nuremberg War Trial. He gained notoriety in 1957 when he was appointed to represent accused Soviet spy Rudolf Ivanovich Abel, who was exchanged for U-2 pilot Francis Gary Powers. He later negotiated the ransom of prisoners taken by Cuba in the failed Bay of Pigs invasion. In December 1964 Rough Riders Farm, Inc. conveyed the property to Laurel Estates Corp., which built and sold houses of Squadron Hill. Later that month, the last horse show was held at the Farm. The first residents of Squadron Hill’s new incarnation arrived in 1966. Today, Squadron Hill consists of 40 houses on 1.5 to 2 acre lots, three ground water recharge basins and a 3.9-acre town park. Almost half a century of suburban landscaping and natural forest succession mask the area’s prior use as a farm, military training camp and summer retreat for the rough riders of Brooklyn’ Squadron C. All that remains are the old stone fireplace, an old barn, one of the sleeping bungalows, and the white gate on Woodbury Road. Informative and well written article. I had no idea about this area! I am so glad to find this…my Dad is the Bill Sloan mentioned in the article and I remember going to The Farm as a kid, playing handball, taking a nap in one of the bungalows, watching the adults play baseball and tennis, and having my first experience on a horse.